York, PA – Macsteel Service Centers USA has installed a high-production Braner/Loopco Cassette Leveler Servo Feed Cut-to-Length Line in its York, PA metal distribution facility. The new Cut-to-Length Line converts 60,000# x 72" wide carbon steel, stainless, and aluminum coil in gauges from .019" through .250" into panel-flat close-tolerance parts. 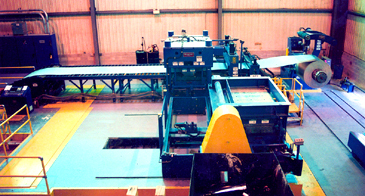 The CTL Line is equipped with Computer Controlled Cassette Leveler, a Precision AC Servo-Feed, and a variable speed DC Shear capable of producing close-tolerance parts at production rates exceeding 80-parts/minute. 60,000# x 72" x 1/4" Cassette Leveler Servo-Feed DC Shear CTL Line. 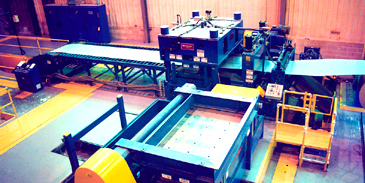 Cassette Leveler: A "Cassette" Leveler allows Macsteel to produce shape-corrected panel flat parts throughout a wide gauge and product range. Microprocessor controlled hydraulic back-up positioning cylinders are housed within a massive 4-post Leveler frame into which quick-change Leveler Cassettes are installed. The exchangeable Cassettes contain all the working Leveler parts . . . work rolls, back-up flights, and drive shafts, in a common housing installed into and removed from the Leveler frame. Cassettes are hydraulically locked into the Leveler frame, and adjustable Cassette back-up flights are automatically aligned with the hydraulic back-up cylinders. Work roll drive shafts are automatically engaged with the Leveler drive gear box as a Cassette is installed. Once a Cassette is installed, a microprocessor automatically accomplishes Leveler set-up based upon material specifications. The Cassette Leveler employs microprocessor controlled hydraulic cylinders rather than motor, gear reducer, sliding wedge, and jack screws to make Leveler work roll adjustments. The hydraulic cylinders are installed at the entry and exit ends of each back-up flight. Precision electronic linear transducers are employed to independently position each of the cylinders. Adjusting the entry end and exit end cylinder elevations causes the work rolls to be "tilted" front-to-back for coil-set correction. Adjusting back-up flight cylinder elevations from side-to-side accomplishes "roll-bend" for precise edge-wave and center-buckle shape correction. Hydraulic Leveler benefits include elimination of mechanical screw-wedge backlash and maintenance, automatic Leveler set-up, job set-up recall memory, automatic Leveler calibration, and bullet-proof reliability. The Macsteel Cassette Leveler is equipped with a 3.000" x 17-roll x 5-Hi Cassette for leveling .250"-.060" gauges, and a 1.500" x 17-roll x 5-Hi Cassette for .075"-.019" gauges. 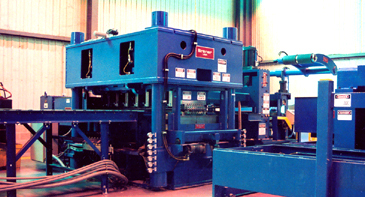 5-Hi Cassettes allow Macsteel to process cold rolled carbon steel, stainless, and aluminum coil. Cassettes are stored on a 2-Cassette Injector Car that exchanges Cassettes in about 2-minutes. A Power Cassette Maintenance Opener "opens" a Cassette to expose all working parts for periodic cleaning and maintenance. 4-Post Cassette Leveler w/ 1.500" Cassette Installed. 1.500" Cassette leveling .024" embossed aluminum coil. The 3.000" Cassette is stored on the Injector Car ready to level .250"-.050" coil. Precision Electronic Servo-Feed: A precise Electronic Feed driven by a high-cyclic rate precision AC servo feeds and meters leveled strip to ±0.005" length tolerances. 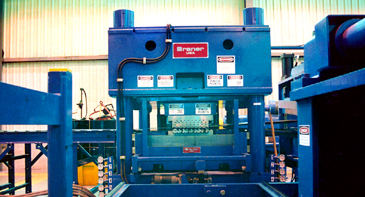 The Servo-Feed draws the leveled strip from a free-loop and feeds the strip to a pre-set length through the Shear. Part lengths are precisely measured by an electronic encoder while a microprocessor automatically establishes ideal acceleration/deceleration rates. Part length and batch count are quickly entered into the digital operating system. 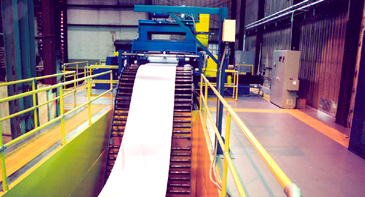 Servo Feeds compare favorably to "reciprocating mechanical feeders" in productivity and reliability. Grabbing, releasing, sliding backwards, and re-grabbing consumes the majority of a reciprocating mechanical feeder cycle time. By comparison a Servo-Feed simply feeds forward and has few parts that wear and require maintenance. The Servo-Feed's quick non-reciprocating operation, low acceleration/deceleration, few moving parts with an absence of chains, screws, clamps, and related mechanical parts gives it consistent close-tolerance accuracy with "bullet-proof" reliability and low operating cost. Servo-Feed draws leveled strip from a free-loop between the Cassette Leveler and Servo-Feed.